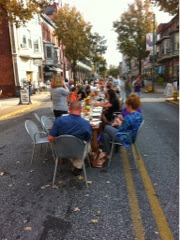 Last Sunday we held the Farm to Street dinner in York, PA. 3 groups worked on this event: Healthy World Cafe, The Horn Farm and Buy Fresh Buy Local York. I'm the chair of York Buy Fresh Buy Local this year, but I can't take much of the credit for this event. And what an event! 100 attendees. Beautiful food, drinks, setting, music. And as people arrived, there were trays of appetizers walked about by a wonderful group of volunteers, most of whom are not food servers in real life. You would never know it, they were so professional. After the tables filled in, the street looked more like this. 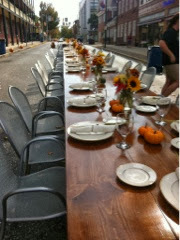 The dinner was held on Beaver Street, right next to Central Market. This market has been in continuous use since the 1800's. 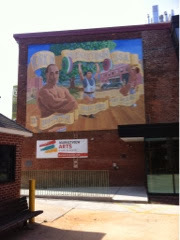 York was the site where the Continental Congress moved to in 1777. After they declared independence from England things got a tad tense, so the decision was made to put the Susquehanna between the unhappy British and those crafting the new laws of the new democracy. There are many historic sites in the city too, still standing from back then. A local business, http://www.pewtarex.com, let us use their beautiful bowls, platters and serving utensils. They have traditional pewter ware, and also cool contemporary stuff they supplied for this event. The food looked great on the platters! Members First, a local financial institution, was a sponsor, and many people attended from their company. What else is in York? You know, the York Barbell company? Home of some of the earliest body builders? Still a spot you can outlet shop for barbells, kettle balls and the like? Which after a meal like that, I should probably be using! It was all so good I had to have...tons of it.